A year has gone by since the last outbreak, but the sickness has taken to the air once more and the game of life and death is starting again: The zombies are coming. And like every year, they will rampage through the Tech Green, tearing flesh from limb, taking down any human that comes their way. It doesn’t help that we are always lacking people in the fight, but when you are out there on the battlefield, you have to make the most of what you have, be it socks, marshmallows or the occasional rapid-fire t-shirt gun. I can only pray that I make it through this semester, but I know that no matter how hard we humans fight, we always fail. The first semester I fought in the war, I made it to the finale in one piece and with high hopes. Our party of survivors was more than thirty strong, each with the burning will to survive. But it meant nothing to the yellow headbands. In groups, we all fell, and in the end, we failed to stop the zombies from defeating us. The next semester, I gave into my hellish instincts, to willingly inflict damage upon the humans. I became a zombie to terrorize those that dared wear the yellow bandana on their arms. But this semester, Fall 2013, is a new dawn. Cheers to my fellow humans, for this semester might be the first time that humankind will succeed against the Tech zombie invasion. Touché to the zombies that dare stand in our way. Goodbye to the humans who fall to the horde, for I know you all are human at heart, but after reanimation will fight us as the fiercest of foes. And good game to all of those who play, humans and zombies, for at least we will all live, alive or undead, unlike the non-players. So grab your yellow bandana, your marshmallows, your socks and your running shoes, and come out and join the fight. On the week of September 16, I will await your presence. For this year’s competition, my journal is here for all to see. I will be updating the Tech population on the ongoings of HvZ each and every day online. Welcome to my Survivor’s Story. 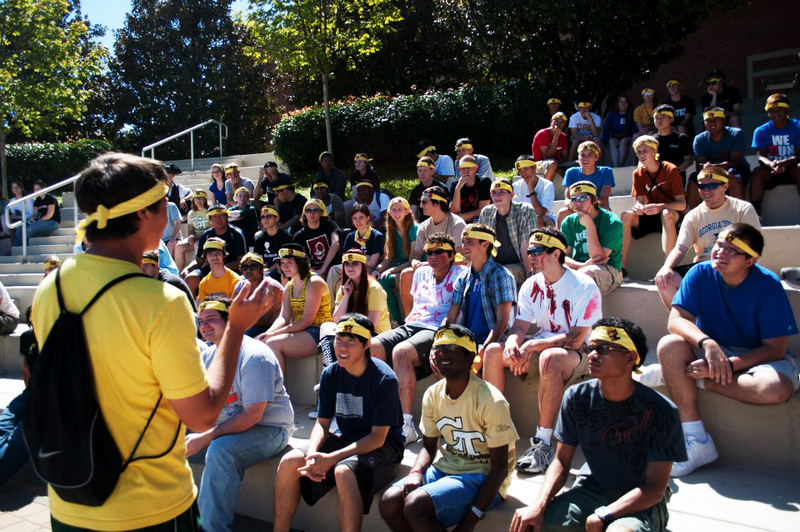 Welcome to Georgia Tech HvZ.